Tom Lewis | Tinker, Tailor, Soldier, Singer! 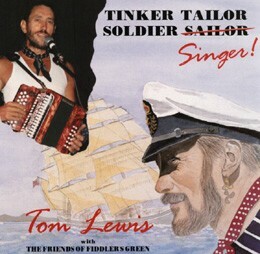 Tinker, Tailor, Soldier, Sailor Singer! Singer! includes the 15 songs listed below; I've quoted Tom's (amusing & informative) liner notes for each. Accompanying performers on Singer! are: The Friends of Fiddler's Green, comprising (in order of hirsuteness) Cherie Whalen, David Parry, Tam Kearney, Grit Laskin, Ian Robb, Alistair Brown & Laurence Stevenson; and Ken Whiteley. This album is dedicated to David Parry, singer and consummate actor who deserved a much bigger role. 150 Days Out from Vancouver. "C. Fox Smith was a fascinating woman and popular author of English Children's stories between the two World Wars. This song is based on her poem: The Ships' Good-bye; from a 1914 book of her poetry entitled: Sailor Town. Her knowledge and insight is profound. Thanks, Cecily, from all of us." Sirensong. "Why did and do sailors (of both sexes, nowadays) become sailors anyway?" New York Girls. "This early version (i.e. from before the polka arrived in the New World) is respectfully taken from Stan Hugill's: SHANTIES FROM THE SEVEN SEAS." The Widowmaker. "I clearly remember, as a small child, often hearing the BBC's words: 'Here is the shipping forecast.' I also remember the many who failed to return. Congo River and The African Trade. "Two songs of an industry which may not, even now, be defunct. CONGO RIVER was an 18th/19th century halliard-shanty. THE AFRICAN TRADE was just one of many commercial euphemisms in common usage around that time; when the vast majority of all slave transportation to the Americas was in Liverpool registered hulls; in defiance of the slavery prohibition laws extant throughout Europe and the British Empire, with the resulting, international, naval embargo." Somewhere Safe to Sea. "The chorus of this song, about two of my influences (London and Bellamy), is from THE GARDEN OF PROSERPINE by Algernon Charles Swinburne (1837-1909) and quoted in Jack London's: MARTIN EDEN." The Busker. "Please spare a thought (and a coin) for purveyors of urban musical relief." Mother Carey. "Yet another fine example of MR. FOX SMITH's (as she was often reviewed) writing." All At Sea. "No matter how far from salt water, it seems that regretful 'never were' sailors abound -- and refuse to give up their dreams." Bully in the Alley. "My distinguished researcher worked overtime on this but still failed to confirm any of the legendary sources and references. However, SHINBONE was un-refutably, a whistle-stop town in the turn-of-the-century ALABAMA. Shinbone, Al. perhaps?" Swallow the Anchor. "Few indeed were the (Royal) naval ratings who escaped being tagged with a 'nickname'. Toughened exteriors often disguised soft-centres; a different interpretation of the term: Shellback!" Message in the Bottle. "To borrow from Marshall McLuhan: the garbage is the message! ; as I realized on a beautiful, deserted Mexican beach." Tinker, Tailor. "If you sing along (or better yet, steal the song) then I'm doing something right." Shiver Me Timbers. "Investigating the reference to 'Martin Eden' in this classic from THE HEART OF SATURDAY NIGHT album led me, circuitously, to SOMEWHERE SAFE TO SEA (ibid)."